Data seems to support the anecdotal evidence. Imports of premium sticks appear to be down this year from pretty impressive levels in 2007, according to the always authoritative CigarCyclopedia.com. Selling cigars, even in the best of times, isn’t really a road to riches. Most of those who do—though there certainly are exceptions—are strongly motivated by a love of cigars and the cigar culture. But, as they say, love don’t pay the bills. Perhaps buoyed by Tampa’s cigar history and a general vacation atmosphere, the area where I live is blessed with an abundance of cigar shops. There are probably a dozen or so legitimate cigar shops of various stripes and sizes within a 30-minute drive of my home. I can’t help but wonder how many I’ll still be able to visit a year or two from now. If you’re fortunate enough to have high-quality shops nearby, don’t forget what your patronage means to them and how much they mean to you. No one should need reminding that with ever-increasing smoking restrictions, cigar shops are among our only remaining refuges. As times get tough, we all look for ways to save money. There’s no doubt that you can do that by shopping on the Internet. And I’m not suggesting you give it up. For some of you, it’s the only access you have to get many of the boutique and harder-to-find sticks. Truth be told, many of the major online cigar retailers also maintain shops, so it’s sometimes difficult to even draw a distinction. What I am suggesting is that you bear in mind how much local cigar shops mean and remember that in an unsteady economy they need your patronage more than ever. Don’t be guilty of Oscar Wilde’s complaint about those who know the price of everything and the value of nothing. Personally, I think online really has hurt the B&M. Different states have different taxes for tobacco which can be a huge difference. For instance, I find RI is$2-3 per stick less than MA across the board. It is tough to pass up the cheaper places and getting more sticks. It's almost like every 5th cigar is free! Any smart B&M could start their own e store and sell online as well to help their business. But when you can get a 5 pack of Ashton VSG's for $45 on C bid and they are $17 each in the store plus a cutting fee in some places if you want an adult beverage, that's a tough sell. The B&M's should focus on the occasional smoker or someone who wants to try something new and couple that with an online model. Volume sales(boxes and accesories) are the buggy whips in a Model T world for Cigar shops. Awesome commentary, George. It’s important for us to remember that cigar shops have many things to offer that online shopping never will—conversation, camaraderie, and a sense of community. I agree 100% George. Cigar smokers need to realize that when they go to a good local shop what they are getting for their money is more than just a cigar. I wrote a very similar commentary on this subject. We definitely see eye to eye on this subject. 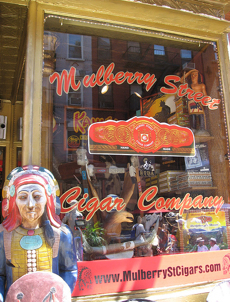 Here in DC, we're blessed with some very good cigar shops who offer great selection, fair prices, and solid advice. Mail order is good if you're buying in bulk, but not so good if you want to try something new, meet a rep, or – God forbid – smoke in public with others. I think the future for the B+M's is to make the store more of a hang. Find the things that online retailers can't do and focus on them. Maybe a drink, maybe some free coffee, a few comfy chairs. Saving a few bucks is important – but I think it's worth an extra buck or three to support businesses that are fighting for their very existence. They are there for us – we should be there for them. Well said, George. I think I'll join in with some of the others in discussing how B&Ms can stay competitive in the future. Ultimately, and sadly, it may be a lost cause (look at what happened to local book stores, even the quirky and community-beloved ones, after Barnes & Noble and Amazon came to town). But it's a fight worth fighting, nonetheless. What can B&Ms offer that online retailers can't? – Intangibles: freebies thrown in every now and then, friendship with the owner after repeated patronage, the ability (in most decent B&Ms) to return a defective cigar on the spot or swap it out for a good one at no extra charge, etc. – Wisdom/mentorship: A good B&M owner, once you get to know him, will be able to figure out your tastes and help guide you to other cigars you might like in a way that the online retailers just can't (yet, at any rate). Furthermore, they can impart their wisdom and experience on you. Same thing with fellow patrons. Even if it's something as simple as telling you how to pronounce a brand name, for instance, that's something you won't get at online shops. George, as someone about to open his own shop, I appreciate your thoughts in supporting B&Ms. Most small shops, even if they have ecommerce on their Web site, find it very difficult to compete with the large, established Internet retailers. They simply can't move the volume so they depend on local customers and regulars. As I've always said, yes, you can buy cigars cheaper on the Internet. But try smoking one there. Great commentary. I love my B&M and I actually don't buy online that much at all. My store's definitely had to change its business strategy around lately, though, converting the back room into a lounge to accommodate more people in the store and to provide a respite from these outrageous smoking bans. I hope it works. I can't imagine life without that shop! It's great to hear from so many people who enjoy terrific local shops. Let's all spread the word! thankyou you are right on. altadis is jrs and general is ci. its going to be hard for the little guy to survive.only business where you buy from big guy to stock your store and he has a bigger one. is in direct competion with you. As more and more states look for ways to boost revenue it is only a matter of time before the states where online buyers live will start sending tax letters to consumers. A handful of states have already started doing so, mostly on cigarettes. The playing field will be level again sooner or later, it is in the mean time that we all must support our locals.